As we continue down the valley trail, we come to camp central. On our right is the 3-acre “pool field,” where campers play countless games. On our left is the swimming pool, a 25-yard pool ranging from 3-6 feet deep. Campers swim every day during summer camp.Up the hill from the pool is the Manna Center. 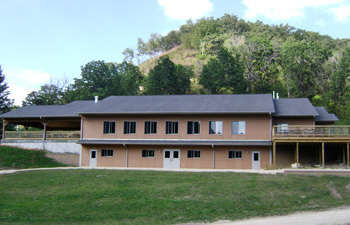 Built in 2009, the Manna Center houses the summer kitchen, a 200-person indoor dining facility, a 100-person outdoor pavilion, the summer infirmary (staffed by a registered nurse or doctor), and a storm shelter able to fit all of the campers. 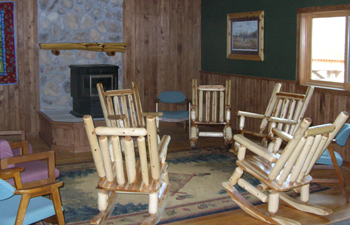 It is also used for retreats. Near the Manna Center, you will find the Art Barn and the “David and Bathsheba” bathhouse. 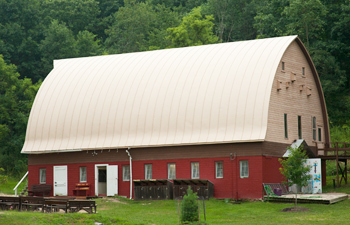 The Art Barn serves as our arts and crafts center, as well as our summer canteen, where campers can buy snacks and sweets. The barn loft is used for large group games and worship. Just down the trail, we find the amphitheater, a place for large-group worship services and skits/plays. 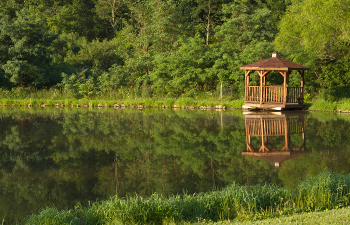 Across the trail lies the pond, where campers enjoy canoeing, frog catching, pond ecology studies, and fishing.